BELLEVILLE – A local MPP says he is pleased the Ontario auditor general will look into whether highways have been maintained to standard this winter. Near the end of February, a motion was passed unanimously at Queen’s Park calling for Ontario’s auditor general, Bonnie Lysyk, to probe the Ministry of Transportation’s winter-maintenance program. Conservative MPP Rob Milligan of Northumberland-Quinte West told QNet News that the unwavering support from all three parties legitimizes the concern from constituents across the province that Ontario’s highways have not been properly maintained this winter. “It’s nice to see obviously other members from all three parties have great concerns as the 401 and 400 series highways go through most of our ridings. I’m sure Liberal and NDP members were inundated with phone calls from their constituents,” said Milligan. Between Jan. 29 and March 12, there were five major pileups on 400-series highways across the province, and numerous smaller-scale collisions. 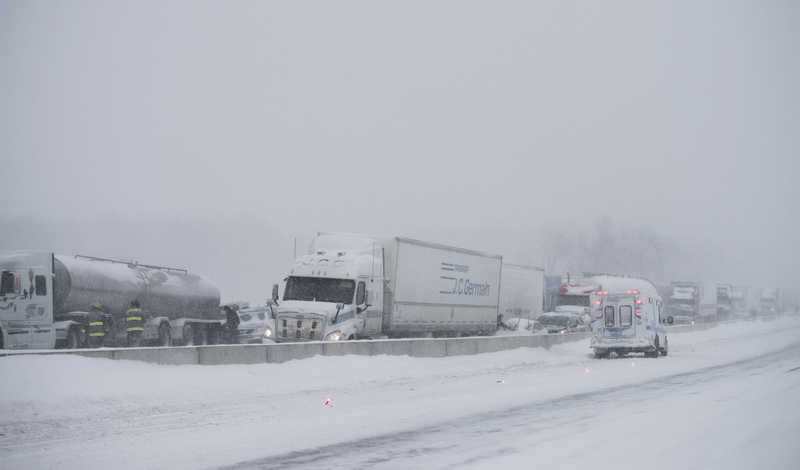 Three of these pileups were along the 401 corridor stretching from Napanee, in Lennox and Addington County, to Cobourg in Northumberland County. Milligan said this is a particularly dangerous stretch of highway during severe winter conditions because it rests in a valley that is close to Lake Ontario. Snow blowing off the lake has the potential to produce severe squalls that become trapped travelling down the valley, he said. Conservative MPPs are not happy with the cutbacks made in the new contracts that the MTO has awarded for highway maintenance, Milligan said. The cuts have reduced the number of plows and salt-storage yards in Northumberland County, which increases the time between plows passing over the road, he said. It was Conservative MPP Steve Clark of Leeds-Grenville who tabled the motion calling for the auditor general to investigate the impact the cutbacks have had. “I wasn’t satisfied with what was happening over the winter. I spoke to my colleagues in my Ontario PC caucus. They agreed – they had the same concerns I had, which ultimately led to me tabling the motion … to have the auditor general review the contracts negotiated by the ministry,” Clark told QNet News. The auditor general will go back to one year prior to when the winter-maintenance contracts were privatized, which was in 1996, to review the scope of the changes that were made in maintenance standards. Clark said he wants the auditor general to specifically look at the number of plows that were used in comparison to today, the plow times, the use of salting and chemical melters, and the hours of operation during severe winter weather. Clark said he was also pleased that his motion was passed unanimously. The auditor general’s report is expected toward the end of this year.